Former WBA/WBC junior middleweight champion Saul “Canelo” Alvarez (44-1-1, 31 KOs) is doggedly determined to fight on the Mexican holiday Cinco de Mayo, even if means that he won’t be facing WBC middleweight champion Miguel Cotto (39-4, 32 KOs). The two fighters are still negotiating a fight for that date, but there’s no way of knowing if they’ll be able sign for the fight. Canelo’s promoter Oscar de La Hoya says that Canelo will still be fighting on that date if the Cotto fight doesn’t happen. This means that unless Canelo gets a really good opponent to face him like James Kirkland or Gennady Golovkin, he’s not going to be able to bump Floyd Mayweather off the date. 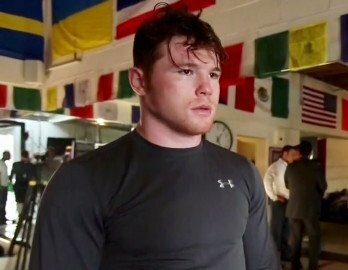 “Regardless of who Canelo fights, he is going on May 2,” De La Hoya told RingTV.com. De La Hoya is just following instructions from Canelo. It’s likely that De La Hoya sees the wisdom of abandoning the date for Mayweather, because he is after all the bigger star in the U.S and the much bigger pay-per-view fighter. The 24-year-old Canelo is still trying to establish himself as a big pay-per-view attraction in his own right in America. Canelo’s loyal fans like to point out that his fight against Mayweather brought in 2.2 million buys. Unfortunately, Canelo’s two fights since then on pay-per-view have brought in a little over 300,000 PPV buys. That suggests that Canelo has a ways to go before he can try and compete with Mayweather in the PPV department. That’s why Canelo could be facing an uphill battle in trying to keep the Mexican holiday fight dates to himself if Mayweather is planning on fighting on those dates. To be sure, Canelo can beat out Mayweather for the May 2nd date if Canelo gets the Cotto or Golovkin fight. But if Mayweather faces Pacquiao, then Canelo can forget about it. His fight on HBO will have to be shown on regular cable because he won’t be able ramrod the fight down HBO’s throat as a pay-per-view clash. Canelo can probably take care of the Cotto negotiations if he gives the Puerto Rican fighter a large enough purse split to make him happy, but it looks like Canelo hasn’t given Cotto the number he wants to hear.